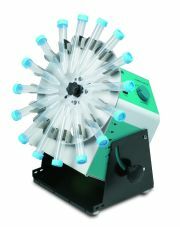 LabRoller Rotators can be used on the bench for general mixing applications and Western blotting. They can also be placed in temperature controlled environments, from 4º to 65ºC, expanding their use to Northern and Southern hybridizations. The rotation speed is variable, from 0 to 50rpm, to provide the specific level of agitation required for a variety of applications. A three hour timer with hold position controls operation. The angle of the rotation axis is continuously adjustable from the horizontal position to a vertical position (90°). Along with the variable speed, this angle adjustment allows for precise control over the level of agitation. Two versions of the LabRoller Rotator are available. The standard model accepts rotisseries, carousels and a rocking platform. The compact version accepts only the carousels. 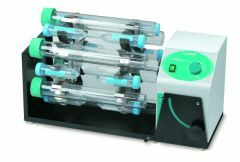 A variety of rotisseries and carousels are available to hold sample containers such as hybridization bottles, 15 and 50 ml tubes, blood tubes and Erlenmeyer flasks.